Will Quantic is known around the world for his blistering stage performances with his band the Quantic Soul Orchestra. 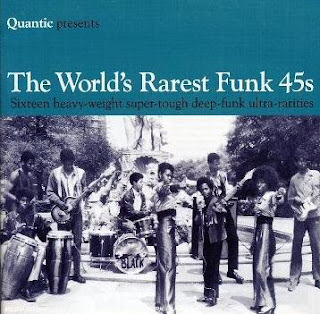 His ear for a good tune, and his feel for a good rhythm didn't come from nowhere - you see Quantic has been collecting rare funk 45s for years, and in that time he has absorbed every drum kick, every horn line and every guitar lick into his very soul. It's a shame that the original 45s are so rare, with only a few hundred being pressed in many cases, but it is possible that with such rarity comes excellence, distinction and quality. We sincerely hope that by drawing attention to not only the music, but the stories behind the music and the performers themselves, we will inspire more people in the world to create and perform music of the calibre that Quantic does today. Listen, learn and enjoy! Jazzman Records. 2006.